Acclaimed author Charlie Carillo revisits Shepherd Avenue, the novel that sparked his career, in a witty, moving story about growing older and (sometimes) growing up . . .
incident—climbing to the top of the Brooklyn Bridge to scatter his father’s remains—earned him newspaper headlines and court-ordered therapy. This time, he’s doing something arguably even more dangerous: buying his grandparents’ old house in the rough Brooklyn neighborhood where he spent an idyllic summer half a century ago. With boarded up stores and bars on every window, Shepherd Avenue sure isn’t the way it used to be. Then again, neither is Joey. In 1961, he was a newly motherless kid trying to find his way. Now a successful children’s book author estranged from his grown daughter, he’s viewed with suspicion by his new neighbors—and with amusement by the beautiful Puerto Rican laundress across the street. Amongst the colorful misfits of his past and present he’s hoping to heal old wounds, forge new bonds, and figure out what exactly brought him back here . . . and how, at last, to move on. Loved the book! Thought it was just as good as the first one if not better. I loved all the characters and felt like I had just stepped back in time when I again pictured the kitchen. Great characters. I am sorry it is finished. 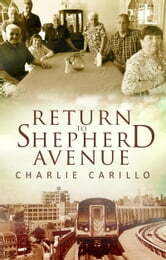 Having read and loved Shepherd Avenue, it was so nice to read the follow-up (taking place 50 years laater) and find out what happened to all the wonderful characters. Two lovely reads, some laughs, some tears, "friends" that will stay with me for a long time. Sorry there is no third book. I absolutely loved this book. The characters were so real I loved them all. The kind of book that makes one sure they were real people having real experiences of life, very easy reading. Beautifully written, helped to hold on to the reader from beginning to end. Can't praise it enough.